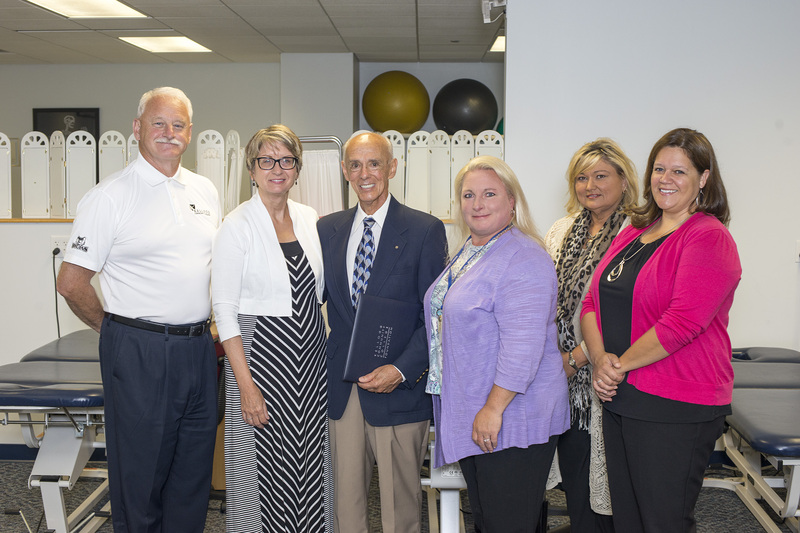 The Kellogg Community College Foundation is pleased to announce the establishment of the Southwest Michigan Rehabilitation Foundation Scholarship for Physical Therapist Assistant students at Kellogg Community College. The scholarship is part of an endowed gift commitment of $100,000 from the Southwest Michigan Rehabilitation Foundation and will provide funds each year to a KCC student enrolling in their second year of the College’s PTA Program. Recipients must reside in KCC’s service area or surrounding counties and have a GPA of 2.5 or higher. KCC President Mark O’Connell and Teresa Durham, executive director of the KCC Foundation, expressed their sincere gratitude for the student scholarship funds at a recent gathering with Mattens and KCC staff including Dean of Workforce Development Dr. Jan Karazim, PTA Program Coordinator and professor Julie Dawes and PTA professor Tracy Wood. Pictured in the above photo, from left to right, are KCC President Mark O’Connell, KCC Foundation Executive Director Teresa Durham, SWMRF President Roger Mattens, KCC PTA Coordinator and professor Julie Dawes, KCC Dean of Workforce Development Dr. Jan Karazim and PTA professor Tracy Wood.